This article was originally published on Saturday, 6 April 2019 at 1:19 A.M. SGT; it has since been updated to include OUE Commercial REIT, OUE Hospitality Trust, Thai Beverage, Indofood Agri, No Signboard Holdings, MindChamps Preschool and Spackman Entertainment. 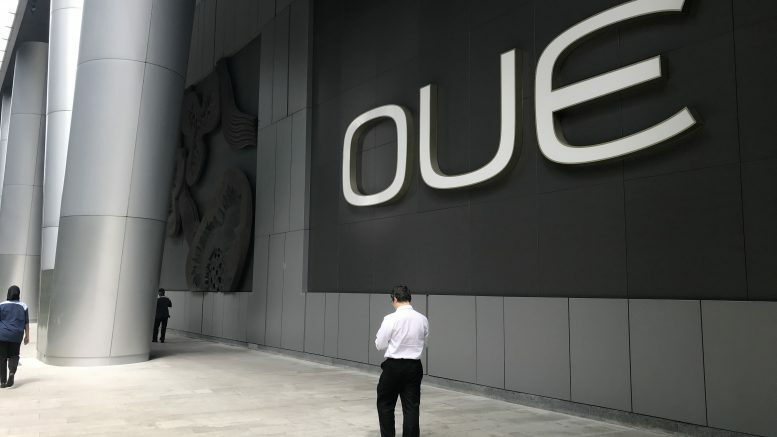 OUE Commercial REIT and OUE Hospitality Trust said on Monday that they were proposing a merger which would create one of the largest diversified REITs listed in Singapore, with assets of around S$6.8 billion. Singapore Airlines said on Friday that it used around S$123.2 million of the gross proceeds from the issuance of S$750 million 3.03 percent bonds due 2024 for the purchase of aircraft. The carrier also said in the filing to SGX that it used around S$1.8 million for the fees and expenses incurred with the bond offering. The remaining S$625 million balance of gross proceeds will be used for costs related to the bond issue and for aircraft purchases and aircraft-related payments, the filing said. Read more about Singapore Airlines. The two companies will also acquire all of Genki Sushi Bangkapi (GSB), which operates the Genki Sushi franchised business in Thailand, Thai Beverage said in a filing to SGX on Sunday. Singapore Exchange said on Friday that it welcomed Aarna Capital as a trading member of its derivatives market, its first member from the Middle East. Aarna Capital, which is a futures commission merchant operating from Abu Dhabi Global Market, provides full brokerage services with a focus on emerging markets; it provides execution and clearing for futures and options, equities, cash bonds and foreign-exchange products, SGX said in a filing. After Aarna Capital’s admission, SGX’s derivatives market will have 64 trading members and 24 clearing members. Read more about Singapore Exchange. Shares of Yongnam Holdings surged a combined 25 percent in a jump in volume traded over Thursday and Friday. In response to an SGX query, Yongnam said on Friday that it wasn’t aware of any information that could explain the share price move. But Yongnam also pointed to recent media reports about the planned around S$9 billion upgrades of Singapore’s two integrated casino-resorts. The company noted a brokerage report had identified Yongnam as a beneficiary of the first integrated-resort developments and had said it was poised to benefit from increased construction activity as a result of the upgrades. Indofood Agri requested a trading halt on Monday, pending the release of an announcement. Read more about Indofood Agri. Lian Beng Group said on Friday that the Stock Exchange of Hong Kong (SEHK) has rejected the listing application of its 40 percent-owned associated company, United E & P.
“The associate will continue to explore potential listing option,” Lian Beng said in an SGX filing on Friday. It had announced plans to apply for a Hong Kong listing in November 2018. Read more about Lian Beng. Silverlake Axis said on Friday that Kwong Yong Sin would retire as group managing director, effective 30 June, but would remain on the board of directors and would take on the role of senior advisor to the board and group managing director. Kwong will also lead the company’s strategic digital value program to boost growth in its digital ecosystem platforms division, Silverlake Axis said in a filing to SGX on Friday. Andrew Tan Teik Wei was tapped to succeed Kwong as managing director from 1 July, the filing said. Tan joined Silverlake Axis in April 2018 as managing director of core banking, and previously was managing director at SAS Malaysia, the filing said. Read more about Silverlake Axis. Soilbuild Construction said on Friday it appointed Ding Yen Shee Daniel as CEO, effective Friday. Ding was group head of business development and investment at Soilbuild Group from 2018-2019, and director of civil engineering at Soilbuild Construction from 2015-2017, the company said in a filing to SGX on Friday. Read more about Soilbuild Construction. MindChamps Preschool said on Sunday it entered an agreement to acquire eight early learning centers located in and around Sydney, Australia, from the Malek Family for a total of A$40.84 million (S$39.35 million). The acquisition will be funded from a combination of IPO proceeds and an acquisition loan, it said in a filing to SGX on Sunday. MindChamps said the acquisition would have a “significant positive impact” on its earnings per share for the current financial year. Once the deal is complete, there will be 82 MindChamps preschool and enrichment centers across Singapore, Australia, Abu Dhabi, the Philippines, Myanmar and Vietnam, the filing said. Read more about MindChamps Preschool. Iconic chili crab restaurateur said on Saturday that Chen Shangming Samuel has ceased to be the sales director for the beer business, effective Friday, to pursure personal interests in other business. Read more about No Signboard. Spackman Entertainment, a producer of Korean dramas, said on Monday China’s ban on entertainment imports and visits from artists from South Korea hurt the earnings of its associated company Spackman Media Group Ltd. (SMGL). Synagie Corp. said on Friday that its brand partners had more than S$1 million in gross merchandise value within a 24-hour period during Lazada’s Birthday shopping event on 27 March. That was up 400 percent on-year and market a sales record for the company, the e-commerce services provider said in a filing to SGX on Friday. Lazada’s Birthday is among the most popular online sales events in Southeast Asia after Singles’ Day, the filing said.